Being able to stay at home to raise our children has always been a priority for my husband and I.
living on one income, even a good income, in today's world is tough. It seems easy enough to say I should look for part time work to supplement our income, but by the time I factor in daycare costs for three kids I wouldn't be making any money. I've thought about working evenings but my husbands work hours don't allow it and if I were to work weekends we would never have any family time together. Ive been brainstorming some ideas to earn extra income as a Stay At Home Mom and I thought I would share my ideas and hopefully inspire some other moms who are hoping to stay at home and bring in some extra income. I ran a home daycare for a few years after we had our first child. 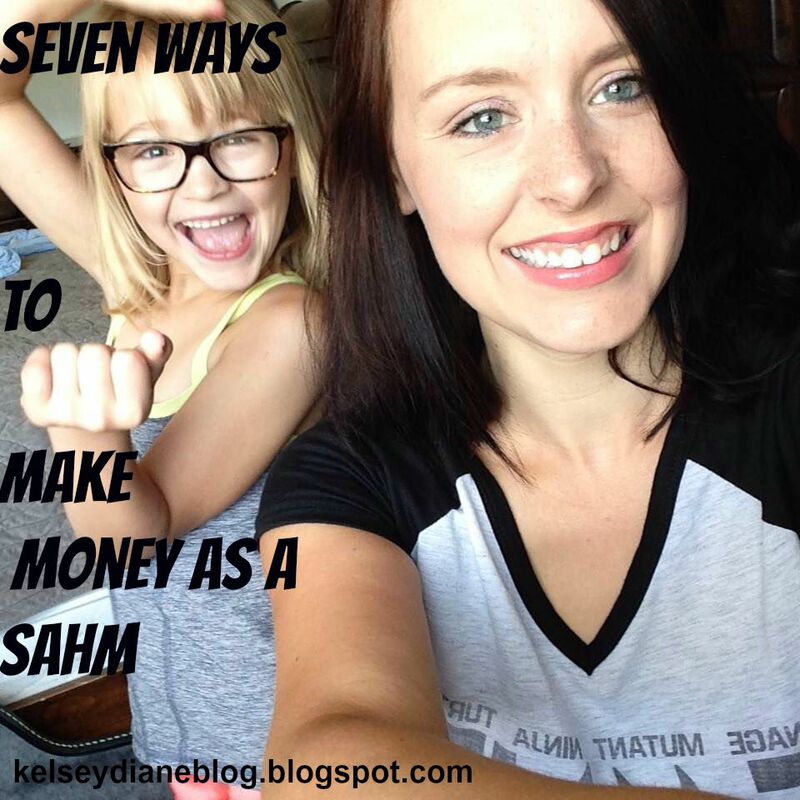 This is a really great option for moms who want to make a full time salary from home. In our area you make anywhere from $30-50 a child per day. Your kids get to socialize and you are already at home with your kids doing kiddy things so it really doesn't feel like "work" to have friends over to play. There is really little to no start up costs as you probably have all the baby/kids necessities in your home already. In the past couple of years I've personally found that this isn't the best option for our family. My oldest and youngest go to Sick Kids for their Vision which requires me to be downtown for appointments. I also have 2 children in different schools with different pickup/drop off times and after school activities that I just find it too chaotic now. I do still babysit for one family as it is only a couple of days a month which helps me bring in an extra couple hundred of dollars a month. If your a mom you know how much crap you accumulate. I honestly don't know where it all comes from but the people at Goodwill know me by name. I mentioned here about our families journey to simplify and I am constantly making piles of stuff that I need to sell/donate. There are a ton of great sites to sell your stuff on like Kijii, Ebay, Craigslist, Facebook Groups and Varage Sale. I sell everything from outgrown kids clothes, furniture, kids toys, jewelry etc. and I've probably a little over $2,000 this year through selling our stuff online. Whatever I can't sell in a reasonable amount of time gets donated. We are so lucky that we live in this wonderful world of technology. Many companies are in need of freelance writers for blogging and other written content. I've done a few freelance writing gigs and I am by no means a good writer. The most I have been paid is $25 for a blog entry which doesn't seem like much but all these little side jobs add up. I always joke that I'm the only mom in our community not selling Scentsy. Seriously though, there are so many MLM companies that can help SAHM's make a great income from home. Some of the moms in my neighbourhood have even been gifted trips to Europe and Disneyland. Back in 2009 I started my first blog (that is no longer running) as a creative outlet for myself and a way to document my new journey in motherhood for my friends and family. I had no idea you could make money blogging back then but now I am making a little bit of money from this blog. There are many ways to make money blogging, through sponsorships, affiliate programs and google adsense to name a few. My last post I talked about money saving apps. I mentioned the awesome app Checkout 51 that actually pays you to grocery shop. Seriously, they will send you $20.00 cheques just for uploading your receipt. I don't know how I would feel about other people washing my dirty laundry but there are a lot of people willing to pay someone to do their dirty laundry! I would love to hear some of the ways you make extra money as Stay At home Mom in the comments below.